It appears that I've centred the appliqué poorly on the background fabric, but in reality it's fine - the blame lies with my lack of photography skills and taking the picture off centre - honest! I'm a bit of a lazy appliquér, and to that end I made some changes. I smoothed out the bumps in the larger leaves - for two reasons. The green print fabric for the super big leaves is quite heavy and hard to needle turn, so I didn't want the hassle of the little lumps and bumps, and if I'm honest, I actually prefer the look of neater leaves. 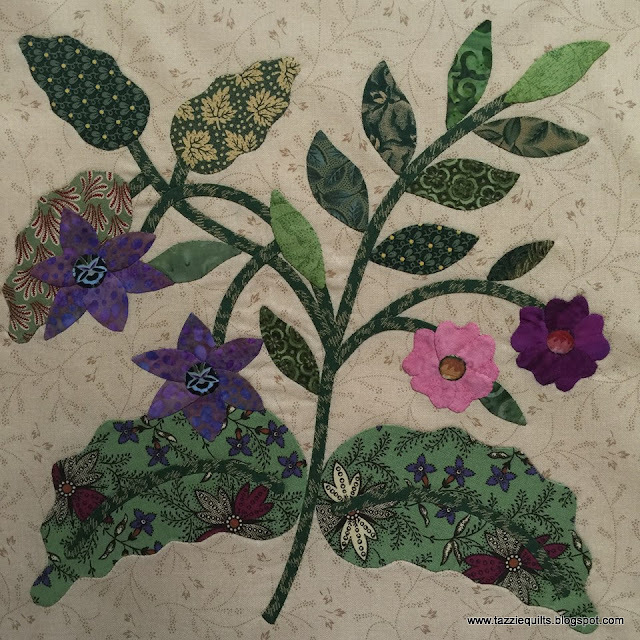 I also changed the centre of the two left most flowers - I liked the William Morris print for the centre, so I used that instead of appliqueing the fussy shape in place. I found it so hard to drag myself away from my Caswell blocks to make this, but once I finally got to working on it, it didn't take long at all. Seriously an hour to put the top together on Friday, and then on Saturday I quilted it, applied the ric-rac and binding - then last night (until quite late watching the tennis) I hand stitched the reverse side of the binding down. Easy! Up to now, I've only thought of this pattern as a table topper, but a little light bulb moment recently helped me realise it could be a baby play mat, and that's what this one is destined to be. I think I'll photograph it nicely and add the pictures to my pattern at the Etsy store. I'll be back to the appliqué this afternoon I hope, I've actually been missing needle turning! Speaking of which, I've had a another question pop up a few times; lovely readers are asking where they may purchase the Caswell pattern. It's available from Threadbear in Castlemaine Australia. Thank you to Monique and Isabel for asking. And Hi to Mary Ann and Celia, lovely to hear from you both again. Just for fun, I created a collage of the Caswell blocks I've made so far. Because I've made 13 blocks, the program has used a couple of the blocks twice, but I have to tell you, I'm loving how this project is coming along so far! Super fun!! I have had a couple of questions from blog followers this week, and I thought it might be worthwhile to share my answers with everyone. Another sweet reader Meryl asked what needles and thread I use. This one is easy - I've used Piecemakers betweens for a long time. For me they're tried and true, and I love that the eye of the needle isn't wider than the shaft. And the thread I've been using is Masterpiece by Superior Threads. While I was in the USA in 2012, I purchased a bobbin donut at the Superior Threads booth, and I have to say it has been one of my most favourite purchases ever! Some of my bobbins are getting low, and I'm going to have to replace my favourite colours soon. May I also just say that I'm not compensated for these recommendations in any way, just a very satisfied customer. No stitching at all so far for me today, and the day is almost over. I've been out and about with Camo, and this evening has been spent doing guild work. If I'm super lucky I may be able to trace another block before I head to bed, but maybe tomorrow will be the day instead. Chatter soon! I don't mind admitting that this isn't one of my favourites so far - it was fine to stitch and everything, but it's not as pretty as some of the others (in my humble opinion). And that's fine - because I know it will look just lovely when placed alongside the others in the finished quilt. Not sure which one I'll work on next, but I'm thinking A4 should be a contender. It will mean I'll be entirely finished the first row which is good ... but those jaggedy edged leaves!?! We spied these William Morris mugs while in Harris Scarfe, and I decided to snap a pair up. They were discounted to just over $4.00 each which I thought was a steal. My morning coffee is sure to be much sweeter with such a lovely view, don't you think? And before I dash, I just wanted to say a quick Hi, and thanx for stopping by to Chantal L. She left a comment on my last post and I wasn't able to message her back. I appreciate all your comments, and always try to reply when I can. I finished the last stitches in this block yesterday afternoon while I was cooking for the hubster's 'significant' birthday party dinner we had last night. It was a really fun time, but I'm feeling mighty tired today. Because it was such a late night, we left most of the aftermath to deal with for today, and the sweet guy has already tackled most of the dishes before I even climbed out of bed this morning. He's a keeper! But back to the block - I didn't necessarily use the same colours as the original block - that purple flower definitely wasn't in the plan. Also, on the blue and yellow flower at right, the two outermost petals I had originally stitched a yellow batik fabric down - when the block was finished I just didn't like them, so I swapped them out for the petals you see now. The yellow ones were just the only thing my eye rested on, so out they went. 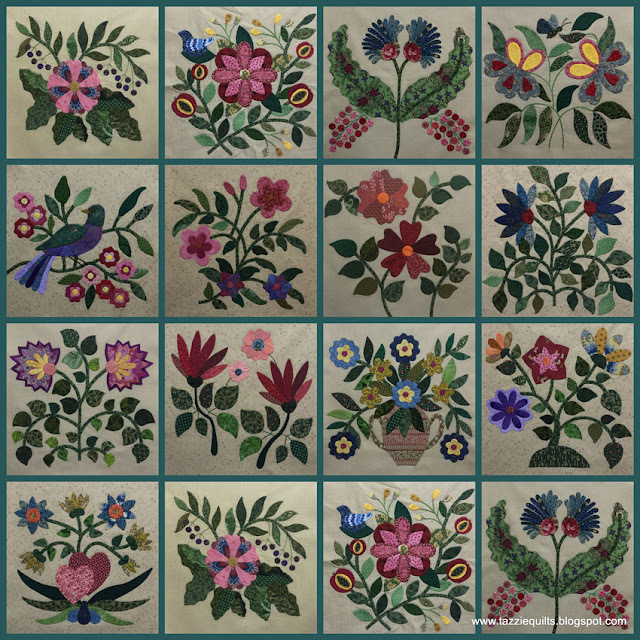 How fun to find that I had the same fabric in my stash that Corliss used for the vase in her original block. I have the print in three colourways and chose to use the one that has a little pink in it - my thinking was that I could then use pink in the centre of the flowers. Two of the fabrics in the block are almost 20 years old. The green in the centre leaf on the vase - it was a gift to me from my sweet friend Linda when I visited with her in the USA in 2000. And the yellow/black print is a Smithsonian print that Sue from NZ sent me a little while back. The Smithsonian collections were around when I started my original Dear Jane quilt back in 1997. I had long ago run out of the yellow, so it was just so kind of Sue to send me some more. What lovely friends I have! Tonight before I head to bed, I'm making a list of the things I must achieve tomorrow. I'm a compulsive follower of lists, so hopefully I won't get distracted and head right on back to the appliqué ... here's hoping! This is my tenth block now, and I'm loving how they're coming along. It's so much fun looking into my scraps for the perfect piece for each of the elements. I don't necessarily think I always get each fabric combo right, but that's okay, I do love to throw zingers into the mix. My sweet friend Donna in Folsom sent me home last year with some of her scraps, and I've been having fun using those too - have you seen them in so many of the blocks Donna? I think 5 of the red petals are from your stash hon! I've also been enjoying the NZ fabrics I mentioned a little while back, The larger light pink flower is made of one of those, and I just love the little highlights of gold - it really appeals to my bling-loving self. I'm hopelessly addicted to these blocks right now, and lucky for me I'm on holidays so I can indulge my addiction. Chatter soon - I'm off to prepare my next block!